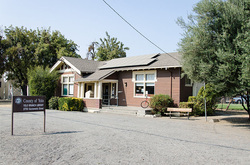 The Yolo Branch Library of Yolo is a Carnegie Library designed by architect William H. Weeks as a modest low wood frame. The Carnegie Corporation of New York provided 121 grants (totaling $2,779,487) to build 142 public libraries from 1899 to 1917. The Yolo Branch received a $3,000 grant in September 1917. The building has become unstable and must be replaced. Check out the New Yolo Branch Library Building Project page for updates.